Outside of a home from the Yellow Pine side. Silver Sage Village has sixteen units, all owner-occupied. There are ten market-rate units in the $650,000-$890,000 price range and six permanently-affordable units at around $150,000 with a program through the City of Boulder. Every home, no matter the price, has at least two bedrooms in addition to a living room, dining area and kitchen. Larger homes have additional rooms, lofts or finished basements, etc. When a home is located on the upper deck, an elevator takes you downstairs to the Common House and lush Courtyard. It’s an easy walk to trails, coffee, eateries, and the SKIP bus to downtown. All RTD transportation is free, thanks to a community-sponsored Eco-Pass. 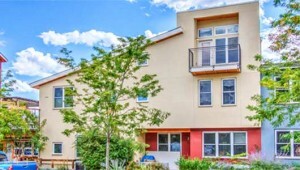 A beautiful energy efficient home in the popular NOBO area of Boulder CO has just been placed on the market. Click here to view photos of the home. This beautiful North Boulder home has a wonderful contemporary feeling with cathedral ceilings and open floor plan. Beachwood floors in living/dining area give a warm, light aspect to the space. At ground level there is a front deck and a lovely private back patio which faces south to the Foothills. In addition to a living room/dining area and kitchen, the ground level has a study and master bedroom with full bath. 1964 sq. ft. with detached one car garage. The downstairs level has an airy feeling with sunlight entering through two large window wells. This level features a large open den area and a second master bedroom with full bath. It also includes 4 storage areas, one of which is a cedar closet for clothing. Priced at $811,000. Owners can be flexible with closing and move-in dates. Buying a home at Silver Sage is more than a real estate transaction – it is a decision to become part of our community. It is important that potential new members of the community learn more about cohousing and the unique aspects of Silver Sage before making their buying decision. The more you understand, the easier it will be for you to decide if Silver Sage Village is a good fit for you and a place where you want to live and age in community. After you have contacted us and had an initial tour, if you decide you want to go further the seller will arrange for you to attend at least one potluck, a more formal orientation and a community business meeting, so you will have a real sense of our community life. In our orientation, you’ll get to ask questions about what it’s really like to live here, about our governing documents and agreements and any other questions. We’ll also get an opportunity to learn more about you and your interest in Silver Sage. While Silver Sage does not approve or reject prospective members, we find these conversations help people determine if life at Silver Sage Village is right for them. If you are interested in seriously exploring a move to Silver Sage, please join our buyer-interest list. We welcome your visit to learn more about cohousing at Silver Sage Village.